When it comes to workplace washrooms, SafeWork Australia lists some requirements that are to be respected by all workplaces. If you have more than 10 employees, you will need to provide separate toilets for male and female employees. An additional toilet should be installed for every 15 females or 20 males. There are many more requirements that your workplace should meet. That tells you how important workplace washrooms are from a legal point of view. However, there is much more to it than just meeting the legal requirements. It is also about saving money and improving employee satisfaction. You need to make sure your washroom has all the elements it needs, including hand washing and hand drying systems, different consumables and regular washroom cleaning. Alsco Australia offers excellent washroom services that you should consider if you feel that workplace washroom management is a bit too much. Before you roll your eyes thinking about how this will cost you a lot, here’s 6 ways outsourcing your washroom services actually save your company money. Running a company means having cleaning staff. There has to be somebody in charge of cleaning the washrooms and providing hygiene services for your company. They will tell you that deep cleaning your washrooms takes up the most of their time. Therefore, if you choose to have washroom services in addition to the efforts of your cleaning staff, you will be able to reduce employee numbers. This means paying less in terms of salaries and other expenses. While there is no doubt that your cleaning staff can do their job very well, it is unlikely that they have the industrial-level tools and the special know-how that people like Alsco have to offer. The people we send are trained to perform services such as deep cleaning, biological treatments and other extremely thorough cleaning methods. This means that for a similar price, you get unmatched sanitary services. In other words, you will get more for your money. There are numerous studies and surveys that show how much employees all over the world appreciate sanitary workplace washrooms. Some of them even go so far as to claim that a big part of your employees’ satisfaction with their workplace has to do with their satisfaction with the condition of the washroom. This may seem like a far fetched idea, but just think about it for a moment. How do you feel when you are in a situation in which you cannot use a washroom properly due to poor hygiene? Miserable, of course. So, how does all this save your money? In employee productivity. When people feel comfortable in their workplace, they are more productive during work hours. You need flawless hygiene systems in place in order to reduce workplace infections. Most viruses, bacteria and other germs spread because of poor hand hygiene. For this to work well, good hand hygiene conditions must exist. Of course, your washroom needs to be squeaky clean for this to happen. Poor hygiene means more workplace infections. More workplace infections means more sick days. More sick days means more burden on your budget and decreased productivity. As you can see from the previous points, workplace washroom hygiene is critical for the success of your company, your employee satisfaction and the state of your budget. Maintaining a clean workplace washroom at all times will take a lot of work from your side. You have to think about a cleaning schedule, the quality of the cleaning, the state of the consumables in it and all of those little things. It may not be a lot, but it piles up, and sooner or later, you’ll end up thinking about your washroom too much. All that time is time not used for your “real work”. You should be making new deals, running the company and be in meetings, instead of thinking about cleaning. That’s how washroom services saves you money by saving you time. This is where Alsco Australia comes in. With our flat rate, you don’t just get cleaning services. We can regularly stock and restock all your consumables. All for a monthly fee. 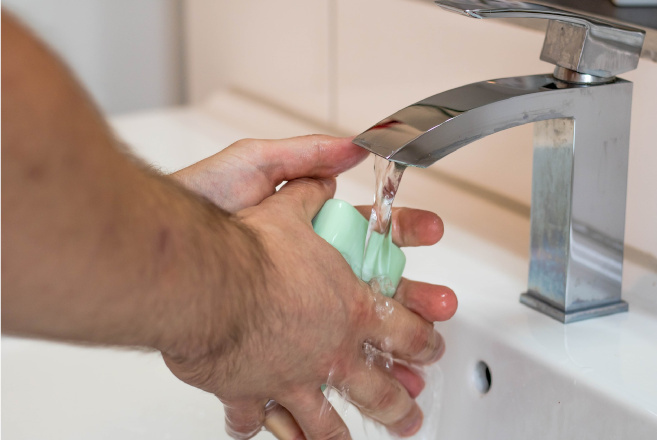 We can offer soaps, paper towels, hand sanitisers and even sanitary waste disposal. There is a wide range of consumables that we can supply you with. It is much cheaper to have that covered by your monthly fee than to go around and shop for those supplies. Now that you understand that a workplace washroom service can save you time and money, it is time to consider improving your efforts in that department. Alsco offers washroom services at a fixed monthly cost that you agree upon. You can always increase or reduce the number of services you require, thus directly influencing your monthly price. Contact Alsco Australia today and get the best possible quote for your company. Our representatives will work with you to tailor an excellent offer based on your requirements. Once you agree on your monthly fee and the services you get for it, just sit back and watch how Alsco improves your workplace experience. Call us now.